An LTE version of Samsung's mediocre 8-inch Galaxy Tab 4 came to Verizon last month, and now one has its eyes set on T-Mobile. 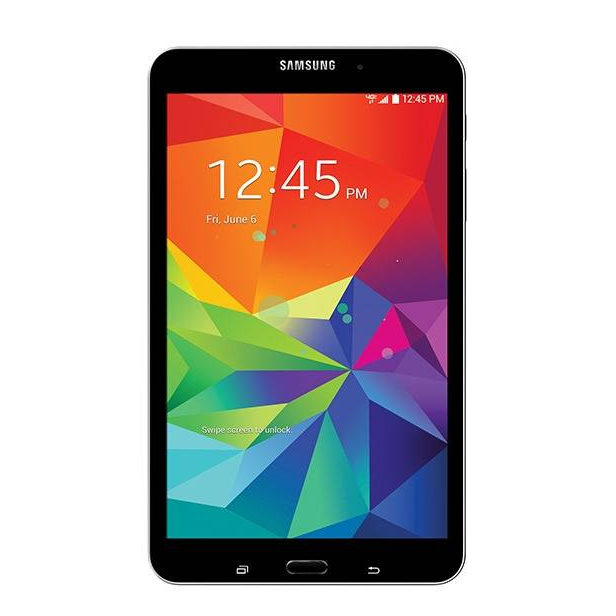 Like Verizon, the uncarrier is pushing this tablet as a great piece of hardware for families to share. Considering the low 1280 by 800 display, I could see this as a great device to let junior smear peanut butter all over. But at 24 monthly payments of $16 ($384, over $100 more than the Wi-Fi only model), I may have to object. In addition to the low resolution, buyers get 1.5GB of RAM, a 3MP rear-facing camera, a 1.3MP front-facing one, a microSD card slot, a 4450mAh battery, and KitKat. The Wi-Fi version has a 1.2GHz quad-core Exynos processor, but LTE variants sometimes get Snapdragons instead. Since this is T-Mobile, customers can add the tablet to an existing Simple Choice Plan and get over a GB of data at no extra cost until the end of this year, with 200MB of free data available in the months after. Shoppers will be able to place orders online starting July 16th, and stores will start selling them in person a week later. 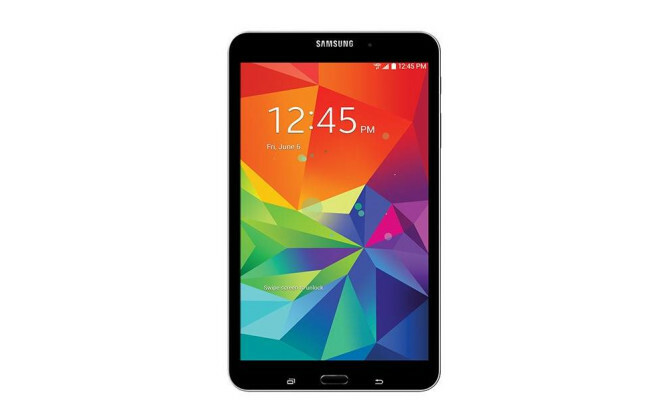 BELLEVUE, Wash.--(BUSINESS WIRE)--T-Mobile US, Inc. (NYSE: TMUS) today announced preregistration is open for the Samsung Galaxy Tab® 4 8.0, an affordable new family-friendly tablet, which – through the Un-carrier’s Tablet Freedom program – can be added to your existing Simple Choice Plan at no additional cost with nearly 1.2 GB of free LTE data every month through the end of 2014 and 200MB of free data per month beyond that for the life of your tablet. The Galaxy Tab® 4 8.0 will be available to order at www.t-mobile.com beginning July 16th and will be available for purchase in participating T-Mobile stores nationwide starting July 23rd. The Galaxy Tab® 4 8.0 is designed for multimedia use by multi-tasking families that stream movies, music and TV shows, and who take and share loads of photos—and is also a perfect match for T-Mobile’s Data Strong network. And at $0 down and 24 monthly payments of $16, the sleek new tablet is an affordable choice for customers looking to get the most value and utility out of their new family tablet. The tablet’s Multi-User Mode and Kids Mode allow everyone in the family to have a personalized tablet experience, while Multi Window™ allows for easy multi-tasking for families on the go. Running on the latest Android Kit Kat operating system, the Galaxy Tab® 4 8.0 also features a brilliant display with 3-megapixel camera and 1.3 -megapixel front camera. The 1.5GB memory and 4450mAh battery provide seamless multimedia use for video play and internet consumption. The Galaxy Tab® 4 8.0 is the latest addition to T-Mobile’s expanded tablet lineup – now including a range of Samsung devices such as the Samsung Galaxy Note 10.1 2014 Edition – offering customers a range of tablets for every need and every price point. Something for everyone. Designed with the whole family in mind, the Samsung Galaxy Tab® 4 8.0 offers virtually endless entertainment options. The new Multi-User Mode, brilliant display and lightweight design make this tablet easy to use and difficult to put down. Always entertaining. Watch your movies come to life and take your games to the next level on the 8-inch display. You can also browse online, read a book and easily stream videos to your TV to share with the whole family. Family friendly. Now everyone in the family can have a personalized tablet experience with their own music, games, apps, photos and more. It’s the best way to keep everything organized and make sure your personal selections are available at the touch of a finger. Better by design. A lightweight build with a fresh design adds a touch of elegance to the Galaxy Tab® 4 8.0, while making it easy to hold and comfortable. Plus, Multi Window™ makes it even easier to operate. Device Pricing for well-qualified customers. Down payment + 24/mo payments req’d. If you cancel wireless service, remaining balance on phone becomes due. Total: $384.00 0% APR O.A.C..
Samsung, Galaxy and Galaxy Tab are all trademarks of Samsung Electronics Co., Ltd.